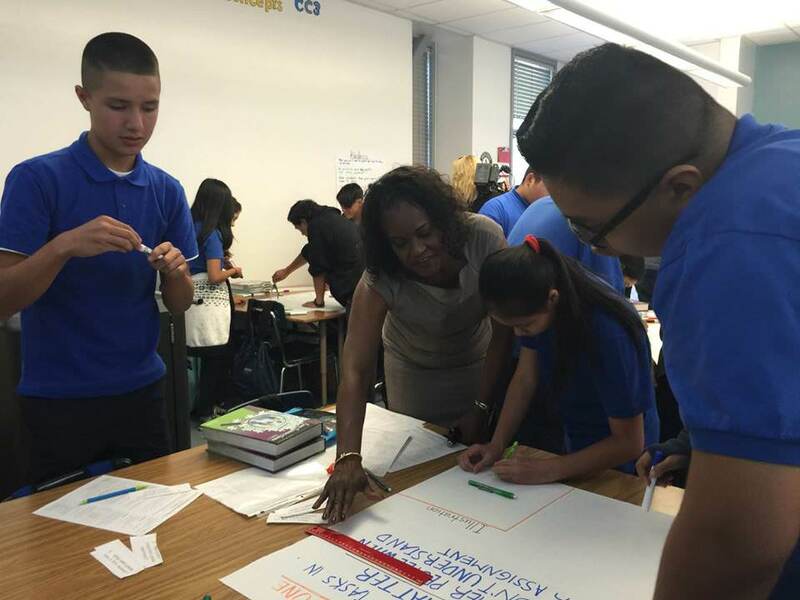 Michelle King visits Luther Burbank Middle School. LA Unified is wasting no time in getting students with poor or failing marks into its online credit recovery program at the start of the new school year. A district communications representative confirmed that credit recovery began right away for any student who earned a D or F in a course now being offered through the program. Last school year, the district did not begin offering the courses until October or November, depending on the local district, but this year it is enrolling students right away in the makeup courses. The program has proven successful in boosting the graduation rate, but the value of those diplomas has been questioned by some academic experts and editorial pages. Last year, the district was facing a huge drop-off in its graduation rate due to the school board raising the bar for what is required. For the first time, seniors had to complete and pass all of their A though G courses, which are required for acceptance into California’s public universities. LA Unified allows students to earn D’s in the courses and still qualify to graduate, although C’s are required by the universities. The district was ill-prepared for the new requirements and entered the 2015-16 school year with only 49 percent of its seniors on pace to graduate. But it was also the first year the district implemented a wide-scale online credit recovery program, which along with some other traditional programs was part of a $15 million effort to help seniors graduate on time. After enrolling thousands of students in the courses — which took place in classrooms in front of computers after school, during free periods, over summer school or during winter and spring break — LA Unified Superintendent Michelle King announced earlier this month the projected graduation rate for 2015-16 was 75 percent, a new record. The district has yet to disclose how many seniors graduated due to at least one online credit recovery course, but some are saying the way the record was achieved is questionable. A recent Los Angeles Times editorial criticized the graduation rate as “not quite as remarkable as it appears” due to the apparent ease with which some students are able to complete the online courses. Academics are also beginning to question the online courses and the high number of graduates they are helping produce. “It looks very fishy,” Michael Petrilli, president of the Thomas B. Fordham Institute, an editor of Education Next and research fellow at Stanford’s Hoover Institution, told LA School Report in February. Still, LA Unified is marching forward with its online efforts, and another $15 million has been set aside by the school board this fiscal year for credit recovery. At total of $400,000 of that is going to a company called Edgenuity that provides online courses. Last year, LA Unified’s Chief Academic Officer Frances Gipson said that California’s public universities had approved the online credit recovery courses provided by Edgenuity and others as acceptable for admission. University of California spokeswoman Claire Doan said recently that the university system has reviewed Edgenuity’s online credit recovery courses offered by LA Unified. She declined to say whether any changes have resulted from the review. She said there will be no change to the admission status of the students who have been accepted to UC schools starting this fall. For its fall 2015 class of freshmen, UC schools admitted 2,659 students who attended public high schools in Los Angeles. Those numbers do not include LA Unified high schools outside of Los Angeles, like Bell High School. It does include charter schools in Los Angeles. In the fall of 2015, 1,504 students from Los Angeles public high schools enrolled in UC schools. Data is not available for this fall. You can search for your own school here. Cal State University spokeswoman Toni Molle said CSU is not investigating Edgenuity courses. The university does “routinely monitor the Edgenuity site,” she said. UC approves A-G course eligibility for both the UC and CSU systems. Some LA Unified independent charter schools are also using credit recovery. One high school has alerted parents by automated phone calls that credit recovery will start at the campus Sept. 1, and any student who had earned a D or an F in an English, math or history class is eligible to take the online makeup courses. The classes are limited, it stated, and seniors would get first priority.